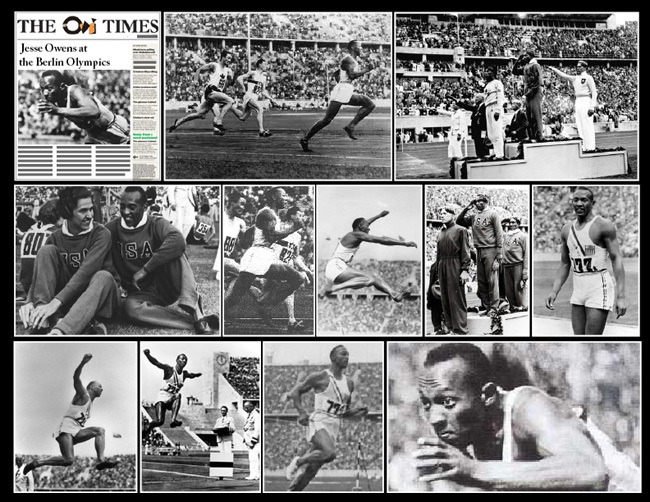 August 9th 1936; Jesse Owens won his fourth gold medal at the Berlin Olympics. He was the first American to win four medals in one Olympics. The first gold was in the 100 meters, where Owens edged out teammate Ralph Metcalfe in a time of 10.3 seconds. Gold number two came in the long jump, where he fouled on his first two attempts. One was just a practice run where he continued down the runway into the pit, but German officials didn't buy it and counted it as a jump. Top German long jumper Luz Long suggested Owens play it safe and jump a few inches before the usual take-off spot. He took his advice and qualified for the finals, where he won the gold with a leap of 26—5½. And Long was there to congratulate him. "It took a lot of courage for him to befriend me in front of Hitler," Owens would later say. "You can melt down all the medals and cups I have and they wouldn't be plating on the 24-karat friendship I felt for Luz Long at that moment." The third gold was in the 200-meter dash, where he defeated, among others, Jackie Robinson's older brother Mack and broke the Olympic record with a time of 20.7 seconds. Gold number four was a controversial one—not with the Germans, but with his fellow Americans. American Jews Marty Glickman and Sam Stoller were supposed to run for the United States on the 4x100 relay team. At the last minute, they were replaced by Owens and Metcalfe and it was reported that Hitler asked U.S. officials not to embarrass him any further by having two Jews win gold in Berlin. Whether that's true or not, the Owens-led U.S. team rolled to victory in a world record time of 39.8 seconds and Owens' magical Olympics came to a close. While German officials denounced Owens, an overwhelming majority of the German fans treated him like a hero. In 1984, a street in Berlin was named in his honour. Jesse Owens proved the theory of the Super-race wrong but of course that did not convince Hitler who intended to prove it by a terrible war and the concentration camps. As we go around misremembering all that today we have laser lights projected on the American Embassy in Moscow projecting Barack Obama as a monkey eating a banana. Have we learned anything from World War II? It appears not.